All Spinfuel readers can redeem the following Coupon Code for 15% Off the purchase of any e-liquid(s). This is a one-use code. There is no restrictions on the number of bottles you can buy in a single order. Use Coupon Code spinfuel15 during your checkout to have the discount applied. Dr. Juice would also like to extend a discount to vendors and vape shop owners when setting up a Wholesale Account. Contact Josh Edwards directly with assistance on setting up the wholesale account and receiving the 10% discount. Dr. Juice is available in Max VG and, for a short while, a 60:40 blends in 30mL and 120mL sizes. We learned in our Interview with Josh and Jeremey that the 60:40 blend is being phased out. Please make sure you read ALL PAGES of this extensive review. Links are below. High/Max VG e-liquids you’ll want to follow along as we go through each flavor, reviewed by each member of the team. A 30mL bottle is $20, or .66-cents per mL. 120mL is $60, or .50-cents per mL. (Best Price) In our collective opinion, $20 per 30mL is well worth the cost, although, once you find the flavors that you know you’ll want to put into your rotations, the 120mL price of $60 is definitely the way to go. Make sure to check out our Interview here. Crunchberry – An homage to one of the best cereals ever made. Delish – A dessert lover’s delight. This mixture of sugar cookie, cookies n cream, with a hint of custard will surely satisfy. Doctor Custard – The doctors take on vanilla custard with a thick full bodied flavor. Best in the industry! Phantom Disco – A fruity flavor composed of strawberry, nectarine, watermelon, and guava that will just explode on your taste buds. Scarlet Eclipse – The ripest strawberries perfect for the picking followed by refreshingly cool lemonade invigorates you from start to finish. Boston George – Decadence at its finest. A mixture of vanilla custard and cinnamon churro that’s sweet and smooth all the way through. 2015 was a game changer for every vaper and every e-liquid brand. Quality is rarely an issue now, and the remaining companies that continue to try to sneak cheaply made e-liquids onto the marketplace are becoming even more rare. Truth is, 90% of the significant brands we’ve reviewed this year were all made with high-quality ingredients. The ones that did not were exposed in a team review, one fairly recent. Every brand will tell you that they use the very best ingredients, why would they admit otherwise, hopefully our reviews can help separate the false claims from the truth. After several years of vaping more than 100 brands each year, and hundreds of flavors, we believe we know quality ingredients. Dr. Juice uses particularly high quality ingredients. From the vegetable glycerin through the chosen flavoring brand(s), an e-liquid will reveal its nature through smell, sight, and taste. An e-liquid should not give off a chemical or metallic taste, it should not smell overly artificial, and there should be zero food coloring used in any e-liquid recipe. Take not that if a particular flavor in this review wasn’t enjoyed by a particular team member it had nothing to do with the quality, just the flavor(s) combination. Personal preference on flavor is 100% subjective, however, the quality of an e-liquid is objective. Lastly, we’ve learned that the pleasant aroma of an e-liquid often has little to do with the flavor produced by the e-liquid in a sub-ohm tank or RDA. That said, it is always a bonus when the pleasant aroma of an e-liquid matches the wonderful flavor. Dr. Juice e-liquids possess splendid aromas and no hint of artificiality. In particular, the Boston George e-liquid possess an aroma that I would happily use as a body scent. Well, you know what I mean… I hope. The flavor combinations in the Dr. Juice line possess underlying characteristics such as, soothing, authentic, and ultimately satisfying. These characteristics are vital to any brand’s success. Every e-liquid brand could create a one-hit-wonder, but doing it on a consistent basis requires artistic talent, a wonderful palette, insight into the desires of vapers, and a dedication to put the customer above the profits. After this 72-hour period of vaping nothing but the Dr. Juice line we do believe that, like a handful of other brands we adore, Dr. Juice has that dedication, that talent, and they have certainly understood the palettes of this team. Each Dr. Juice e-liquid possess an abundant amount of clean, non-artificial flavors. The custards are rich and luscious, but not overwhelming. The fruits are fresh, authentic, bright. Dr. Juice e-liquids shared the same intensity (high or low, you’ll see), the same level of satisfaction, and in the end it will just be a matter of what flavors appeal to you. Beginning with this team review you will now see two rating per flavor, per team member. The General Rating is what counts toward earning a Spinfuel Choice Award, the secondary rating is used to express our personal flavor score. We will expand on this new designation in a piece I am writing now, entitled “What A Spinfuel Choice Award Means Today”. Julia: 4 Stars – I’m not that keen on cereal e-liquids and if you look back over our 4-year track record of reviews you’ll see that we don’t review them often. The reason is because we seldom, if ever, taste the cereal it is supposed to replicate in vapor form. Take Crunchberry for instance; is this supposed to be Captain Crunch Crunchberry? I have no idea. So let’s forget the cereal for a moment; what do I taste in Crunchberry? I taste various berry flavors, sweet, light, and slightly fake. That’s not necessarily a bad thing, sometimes a flavor has to be faked because the real thing is a fake. I mean, there is no fruit called Crunchberry. Kiera: 5 Stars – I think Julia has it all wrong with Crunchberry. In an effort to convince my lovely Jules I went to Shaws grocery store and picked up a box and poured a bowl for Julia. I had her try it with milk, and without. She still doesn’t taste it. Crazy! Out of the box there is no difference at all between the flavor of the cereal and this delicious e-liquid from Dr. Juice. I loved it, and though right now there isn’t any room in my fruity rotation (I don’t have a cereal section), I definitely see a future for this one. Tom: 5 Stars – Listening to Julia and Kiera in our discussions talk about Crunchberry was hilarious. They both love the flavor, but one says it tastes just like the cereal, the other says it doesn’t taste anything like it. Well, to me it does taste like Crunchberry cereal, as weird as that is. Jason: 5 Stars – I imagine a lot of people will argue over cereal flavored e-liquids forever. I seen it happen. When I spend my time with Crunchberry I could easily taste the cereal it’s named after, but others might not. I don’t think that’s the point anyway. Julia: 5 Stars – When I saw the name Delish I recognized the word “Relish” somehow, and for several minutes before vaping it I imagining an e-liquid that would taste like a pickle. I’m dead serious. Thankfully I was oh-so wrong. Kiera: 5 Stars – I guess this certainly is the season for sugar cookie flavors. In the past month I think 4 or 5 sugar cookie eliquids made it into one of my Nebox’s and this one is among the best of the best because I actually taste ‘sugar cookie’. While vaping Delish you too will taste a real sugar cookie blended with a nice kind of Oreo-type cookie flavor and a tinge of vanilla custard on the exhale. I vaped Delish until it was empty and I still couldn’t decide if the vanilla custard was the same flavoring used in Boston George, but it was close enough, not that it mattered. I know Julia tasted more sugar cookie on the inhale, but I tasted the vanilla on the exhale, with a small sugar cookie note. The cookie n cream and the hint of custard was limited to the in-between time, if you can believe that. It’s three flavor layers both mix and separate, so we can all enjoy something a little different each time. Tom: 5 Stars – Delish is the first sugar cookie eliquid I vaped this year that tasted more like sugar cookies than anything else. A fantastic flavor blended with just a few notes of cookie and cream on the exhale. If there is a custard here I get the feeling its here for “body” and not actual flavor. If I’m wrong, then it is just a whisper of custard. Delish is best vaped at moderate wattage, nothing too far under or over the recommended wattage or temperature. This is where you will find the fullest flavor and the most voluminous vapor. Julia: 5 Stars – We avoid using words like “best in the industry” because we simply haven’t vaped every single custard eliquid out there. We will happily say that any particular flavor is the “best we have had” though, and when it comes to Doctor Custard, the truth is that it may not be the absolute finest vanilla custard I’ve had, but it sure is wicked close. I vaped Doctor Custard more than a day after vaping Boston George, a vanilla custard and cinnamon churro blend, and I enjoyed Boston George more because it wasn’t as heavy as Doctor Custard. Doctor Custard is almost a traditional custard flavor, but because it seems to be blended so expertly that it rises above most other heavy custards. There is more ‘flavor’ than ‘custard’ here, if that makes sense, despite being a singular flavor blend. Jason: 5 Stars – Doctor Custard is far away from my usual eliquid flavors. Although I do enjoy many kinds of flavors now, custard has to be just right for me to get anything out of it. I wound up vaping Doctor Custard last because I wanted to save the heaviest flavor for last. As it turned out, Doctor Custard wasn’t all that heavy. I genuinely enjoyed it. Julia: 5 Stars – This is a flavor that some people will love like nothing else, and other people will be turned off by. For me, what stops me from adding this mostly delicious eliquid to my collection is that sharp guava on the exhale. The ripe strawberry, the nectarine, and even the watermelon to some degree are all pleasant tasting, but that end flavor, the guava… it spoils an otherwise good flavor blend. Tom: 5 Stars – On days when a fresh, clean fruity blend calls to me, this one could be my all-day-vape. I pretty much agreed with everything Julia had to say about Phantom Disco during our discussions. That is that this is an expertly blended fruity vape with really nice layers in a complex flavor profile. But, on the exhale, there comes a spoiler… a weird tasting guava. Is this Phantom Menace, or Phantom Disco? It depends on what the taste of guava does for you. Julia: 5 Stars – I came real close to having my heart sink over Scarlett Eclipse. Just reading the word lemonade was enough to do it because most lemonade flavors I’ve had hit me with too much sour/tartness to become a favorite. But I love rich ripe strawberry flavors, especially when the strawberries are sweeter than they are anything else. But, I filled a tank and let it sit for a few hours and then began vaping it at 30W with a half-ohm coil. After the first lung hit I relaxed and knew this was going to be a good experience. Kiera: 5 Stars – One word in the official description saved Scarlett Eclipse from a 4 star to a 5-star rating. That word is “cool”. I was curious about it before I started vaping. Tom: 5 Stars – Since I won’t be leaving the ‘conclusions’ at the end of this review I’ll include what I want to say here. It fits well here. After vaping all the various flavors, including two holiday blends by Dr. Juice, it is very clear that this brand knows how to mix an expert e-liquid. That’s not to say that you’re going to like every flavor, but when Dr. Juice says something is a vanilla custard with cinnamon churro, or ripe strawberries followed by a lemonade you can bet that is exactly what it is going to be. Julia: 5 Stars – What makes Boston George so damned good is the actual “vanilla” in the vanilla custard, and that tap of sweet cinnamon churro that blends so perfectly you just do not want to stop. This is such a delightful vape it’s hard to believe. Kiera: 5 Stars – I was genuinely surprised by Boston George. From the official description I expected a super rich, dense flavor. The word ‘decadence’ doesn’t really fit for me, a better word is a word we’ve all used before in our reviews… luscious. 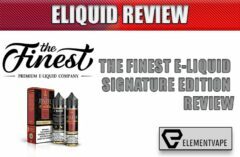 Tom: 5 Stars – A remarkable year gets really close to the end and in all that time I’ve enjoyed so many great e-liquids from many, many brands. You would think that by now I would expect all the e-liquids that come in for review to be outstanding, and when it comes to the quality of the juice that’s mostly true. But flavor? Not always so true. Boston George, however, sits up there with the best of the best. Jason: 5 Stars – I nominated Boston George for a Spinfuel e-Liquid of the Year, in the ‘Dessert Category’ because of all the vanilla custards I’ve enjoyed this year this one is by far the best. But I want to be clear; it is the ‘vanilla’ component, combined with the cinnamon churro, that slams this one home. The actual custard flavor is a less heavy than others I’ve had, and I would go so far as to say that instead of recognizing a vanilla custard it is more like a vanilla cream. Holiday Flavors – A Bonus Round! Julia: 4 Stars – My first impression of Enigma, as well as Headless Horsemen, was very negative. I’m talking artificial flavor, edgy and totally unlike the other eliquids from Dr. Juice. They were both so bad I emptied my tanks, resealed the bottles, and stashed them in my desk. Now I know why, I think. Dr. Juice does not include a Born On date on their label, for obvious reasons, so when I opened both bottles a full week before we started this review, I suspect that I was opening a bottle that did not have enough steep time. I say this only because when I revisited them for this review the flavors pounced out and punched me in the face for being so rude before. Both holiday e-liquids changed dramatically during that week off storage. Kiera: 4.25 Stars – Okay, here’s my take on Enigma. Every flavor that is described in the description is there, so there is that. But… the flavors are very, very light. Jason: 5 Stars – I was crushed to hear the comments about Enigma from my other team members. They all complained that the flavors, though they were there, barely registered with them. I think they are getting it wrong. If you buy, or already bought, a bottle of Enigma you will notice instantly that this e-liquid is composed of ingredients that look, and taste, very different than the main non-holiday flavors. There seems to be tens of thousands of tiny specs of what I believe are real apple bits, or maybe churro bits, I’m not that sure. And the liquid itself runs down the glass dropper like its alive. I’ve only seen this kind of ejuice in organic flavors, although I have no idea if that’s the case here. Julia: 5 Stars – I knew I was in for a very different experience in the review process then when I vaped it as it came in the door. This time I could smell the pumpkin and the sugar cookies, and even a hint of the graham crackers. So I loaded up a tank, let it sit for a bit, and vaped away. Kiera: 5 Stars – When Jules was trash talking the flavor of Headless Horsemen I decided to remain quiet because of our prior team meeting argument. But I couldn’t believe she disliked the pumpkin custard so much. Yes, it is a “new” flavor that we’ve never encountered before, and it’s okay not to like a flavor. But to vehemently despise a flavor? So unlike her. But, this is about me and my impressions of the Headless Horsemen. Tom: 5 Stars – The only problem with Headless Horsemen is the pumpkin custard. You see, unlike other pumpkin flavors, which are ALWAYS mixed with other spices, like cloves, is a very plain, and strange, flavor. Fresh pumpkin…have you ever tasted fresh raw pumpkin? If you have then this is it. I think this eliquid would have scored better with certain people IF Dr. Juice said up front that it was not a spiced up pumpkin and instead it was actually a real honest pumpkin. At first the flavor is strange, awkward even, but if you stick to it you’ll begin to enjoy it. Ramp up the warmth of the vapor and you will really enjoy this fresh pumpkin custard. Jason: 5 Stars: Unlike Enigma Headless Horsemen does not look or smell like an organic ejuice. No specs of pumpkins or anything else, it looked more like the other eliquids. That said, the pumpkin custard flavor was light, the sugar cookie was almost lost, and the graham cracker barely hit on the exhale. A good all day vape for the holidays, if you like non-spiced pumpkin, and a 5 star eJuice for all the other reasons. The flavor, on the other hand, could have been more pronounced. The opportunity with a pumpkin flavor lies in knowing that pumpkin is rarely thought to be a nice flavor unless it is mixed with certain spices. Pumpkin Pie doesn’t taste like pumpkin; it tastes like pumpkin pie. That’s the key, and the audience for Headless Horsemen is going to be scarce. In the end, after you determine the quality of the ingredients, it’s always about two things; flavor and vapor. Does Dr. Juice deliver on one or both? Our team spent a full 72-hours vaping only Dr. Juice e-Liquid, and each of us vaped our 30mL bottles using different sub-ohm tanks and mods, at different times of the day, under various circumstances, striving to arrive at a review that you can trust. Yes, we understand everybody has their own opinion on flavors, what I like you might not, and so on, but if you’ve been reading our team reviews (we’re on Year 4 now!) and trusted us enough to try some of the brands and flavors we reviewed, and you found that those reviews agreed with your taste tests, then you can rely on the fact that we will always do our best to tell you exactly how much we liked, or disliked, any flavor from any brand. Dr. Juice really delivered the goods this week. We enjoyed them, some more than others, and always, each team member wound up with favorites that will be added to their vaping rotation, or collection, for personal vaping…when the time for personal vaping is found anyway. The primary Dr. Juice line is superb, though we did have some issues with their Holiday line. So much so that the primary line and the holiday could have easily been made by two different brands. The Dr. Juice signature went missing with the Holiday flavors, that did not go unnoticed. We hope you have a better understanding of these reviews with the introduction of the “secondary” Flavor rating. We believe that as we review more and more quality brands you’ll benefit from this second rating. If you are a Dr. Juice fan sound off in the comments. How do our impressions compare to your own? Which ones are your favorites? Pick up some Dr. Juice e-Liquid right here. Previous : On Vaping: United We Stand!